Last Saturday morning it was cold at about 3 degrees F. so I had to wait for it to warm up a bit before going out. 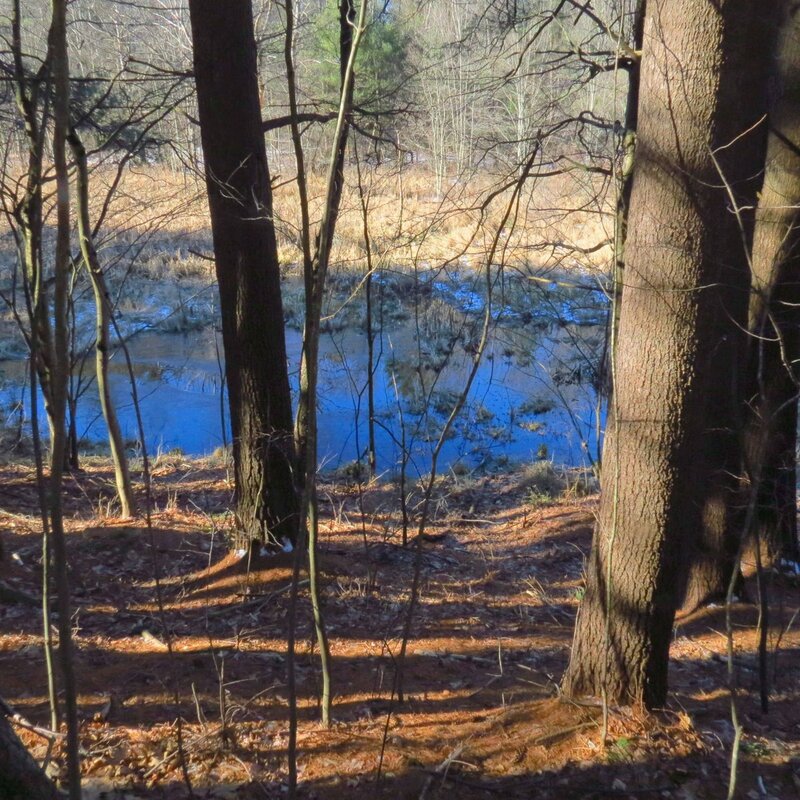 My camera doesn’t perform well at anything below 10 degrees and neither do I, so I waited until the thermometer read 20 degrees before visiting a local swamp. I was hoping to show you the flock of mallards that swam here seconds before I clicked the shutter but apparently they thought my collapsible monopod was a gun, because as soon as I went to extend it off they flew. I was at the crest of the hill shown here and they were far below, but they still saw my every move. 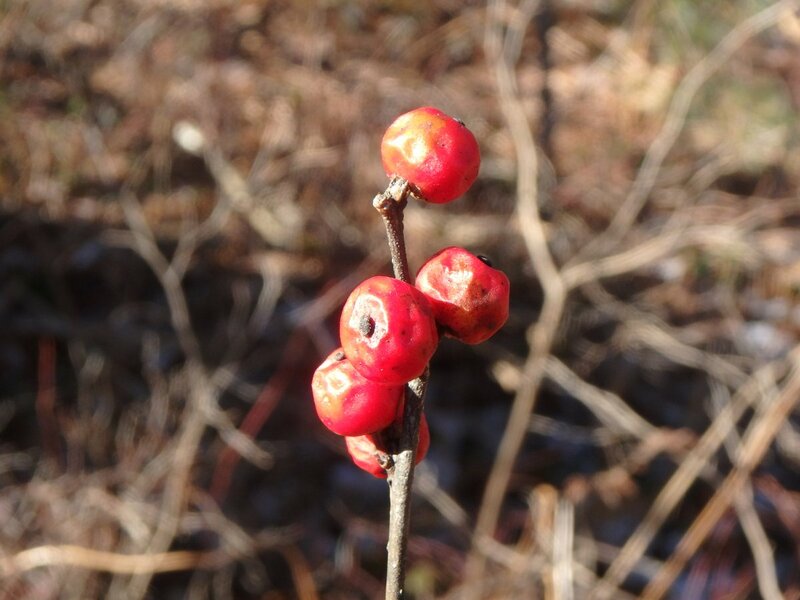 So instead of the wildlife I concentrated on the plants that grow here, like these winterberries. Winterberry (Ilex verticillata) is a native plant in the holly family and is toxic, but birds snap up the berries fairly quickly so I only saw a handful of rather puckered fruit. This plant loves wet feet so if you find it you can almost always be sure there is water nearby. Native Americans used many parts of it medicinally but they knew how to prepare it so it would cure and not make them sick. I come to this swamp specifically because it is the only place I know of to find skunk cabbage (Symplocarpus foetidus,) which is usually our first flower to appear in spring. 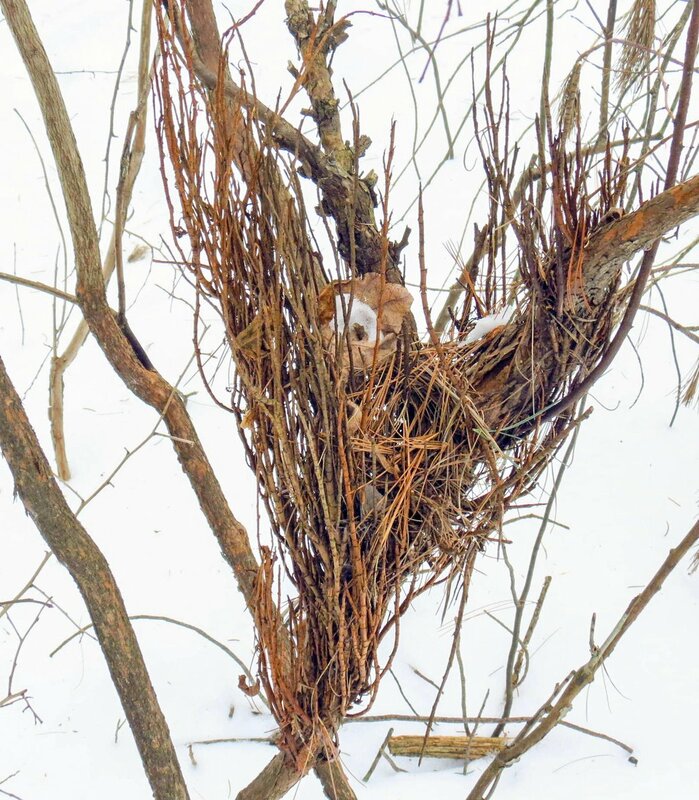 But as the above photo of its shoots shows the plants are there all winter, just waiting for the sign that it is warm enough to begin growing again. 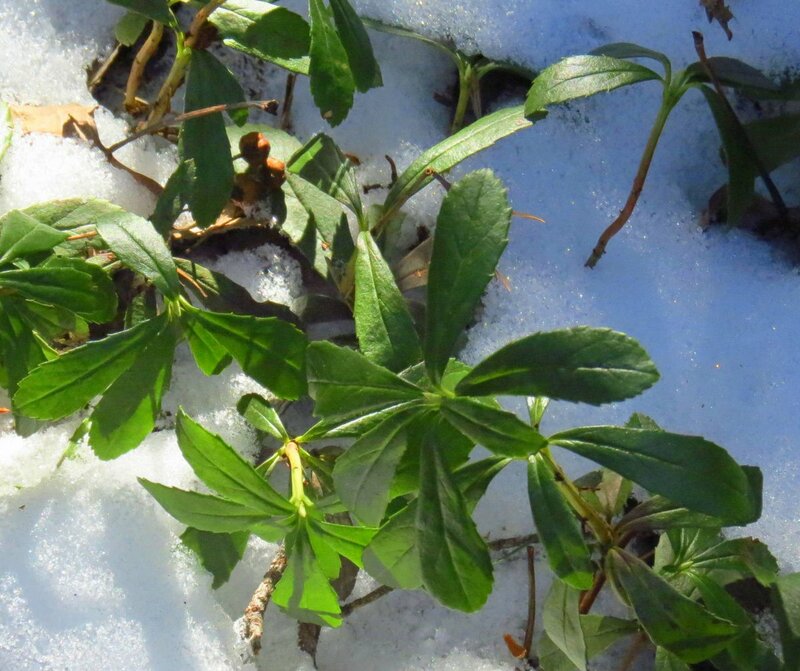 That date is usually in early March and the plant, through a process called thermogenesis, will grow through any amount of ice and snow to bloom. It can do that because it produces heat and can raise its temperature as much as 60 degrees F. above the surrounding air temperature. The splotchy maroon and yellow spathes are always a treat to see because they mean that spring is here, no matter what the calendar says. Another sign of spring I watch for is when the catkins of American hazelnuts (Corylus americana) start to turn golden yellow. This is a sign that they are producing pollen and that means that the tiny scarlet threads that are the female flowers must also be showing. The bud on the right is a female bud and the tiny female flowers will grow from it in early to mid-April. 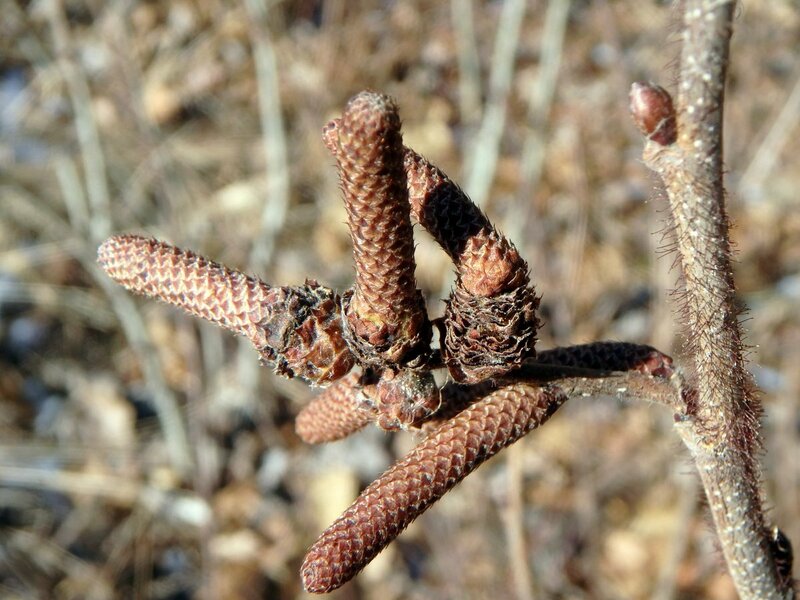 A good way to tell that you have an American hazelnut and not its cousin the beaked hazelnut is by the very hairy stem seen here. Only American hazelnut has hairy stems. 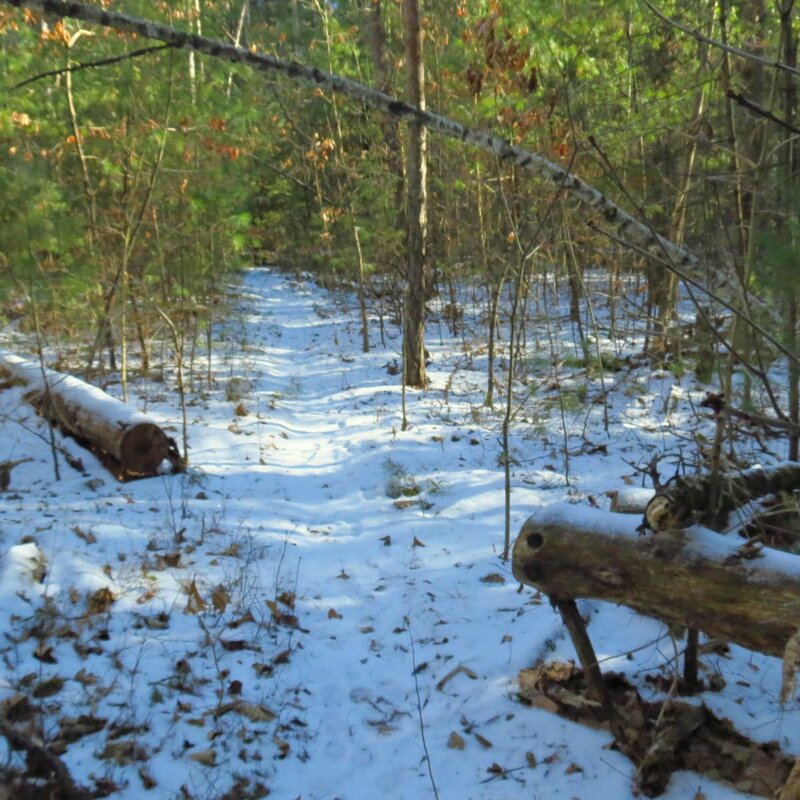 The forest was nearly free of snow but the trail through it had a light coating. That’s probably because it was well packed and icy. It hasn’t been easy to find much snow in this part of the state this year and I’m not complaining about that at all. The weather people are hinting that a stormier pattern will crop up towards the end of the week. 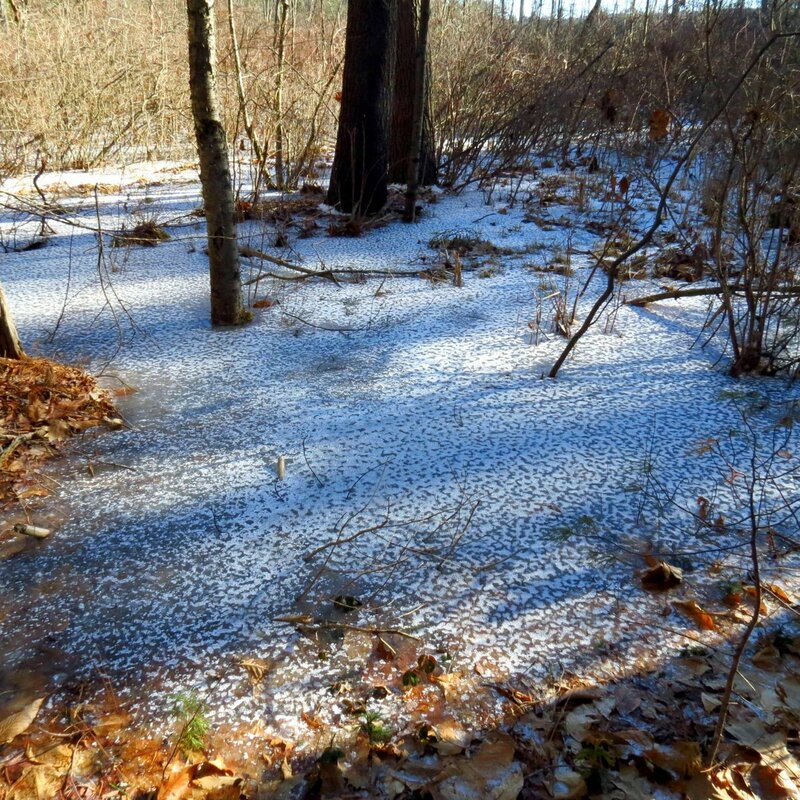 There was one spot in the forest that had a measurable amount of snow and I wondered why only this spot had so much. 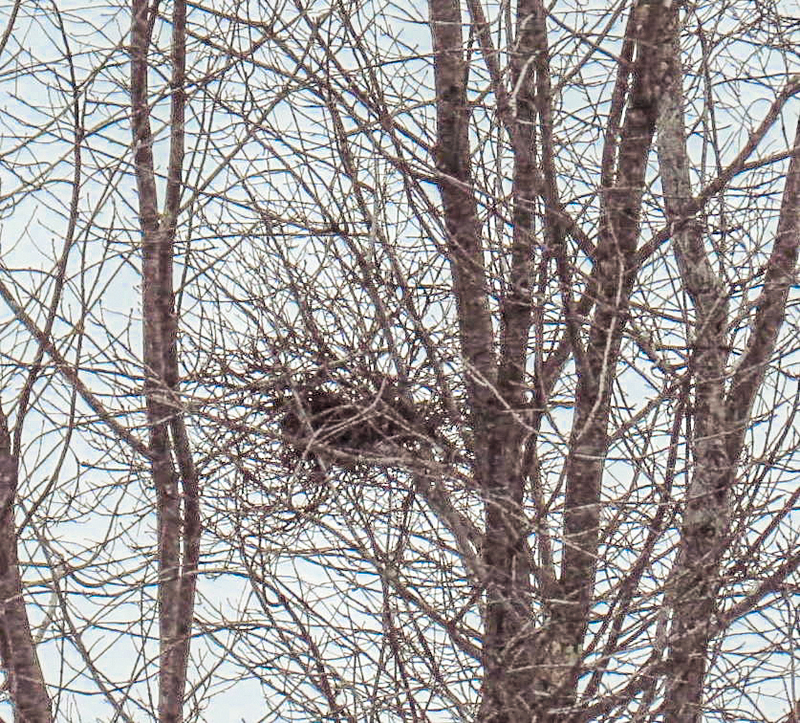 That was because there weren’t many evergreens overhead. 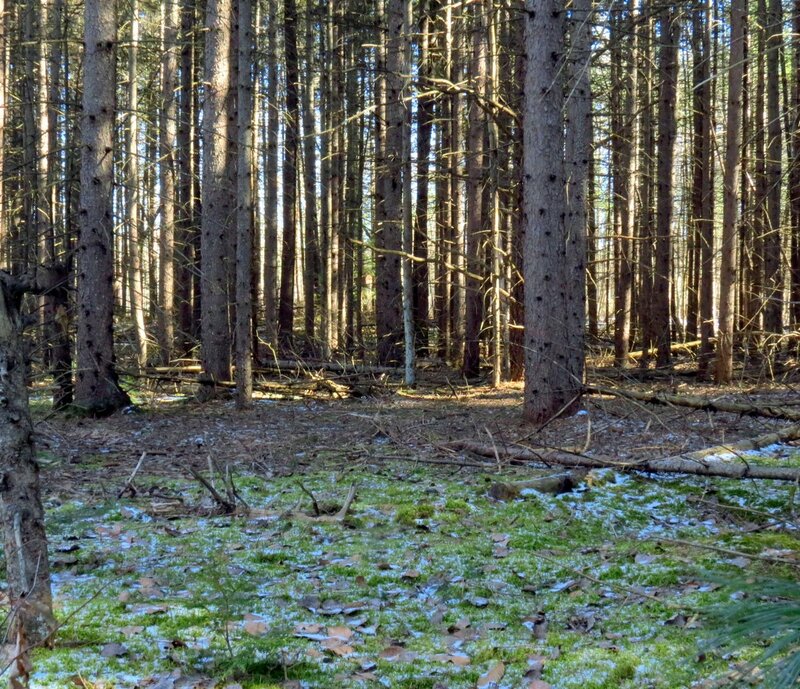 Evergreen trees keep an amazing amount of snow from reaching the ground. 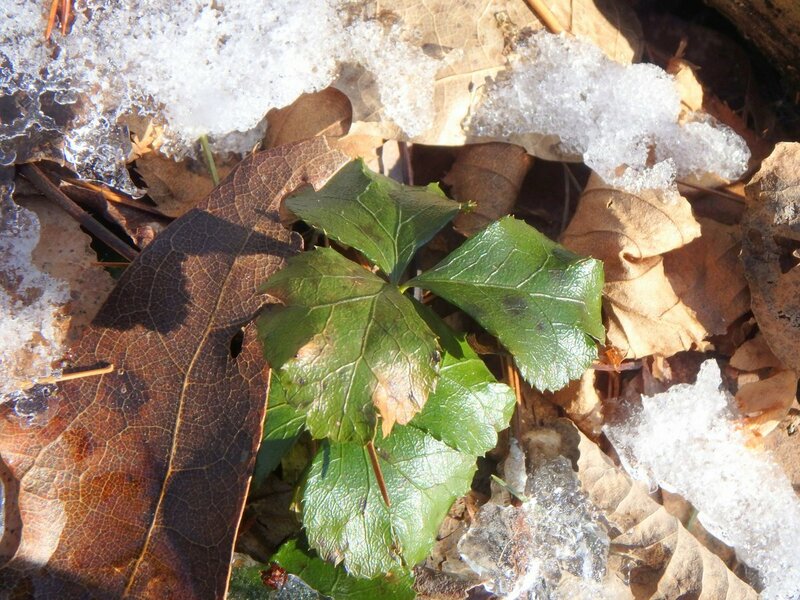 The shiny evergreen leaves of pipsissewa (Chimaphila umbellata) poked up out of the snow. This plant is one of our native wintergreens and it likes to grow in undisturbed, sandy woodland soil that is on the dry side. It was once used as a flavoring in candy and soft drinks, including root beer. Its common name comes from the Native American Cree tribe, who used it medicinally to treat kidney stones. It was thought to break them up into pieces. Even though pipsissewa photosynthesizes it supplements its diet by taking certain nutrients from fungi, and for that reason it is considered partially parasitic. 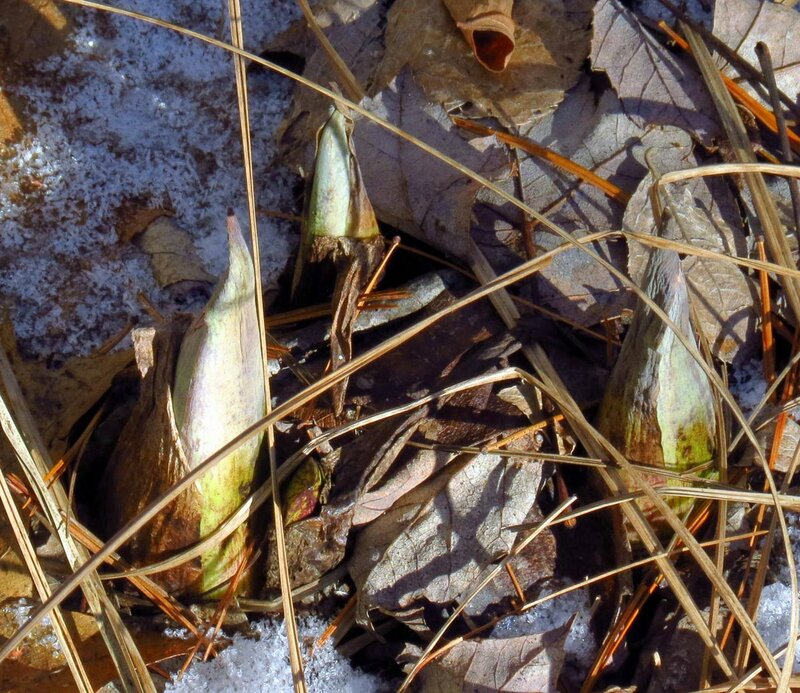 The pretty little seedpods of pipsissewa persist through the winter and poke up out of the snow. 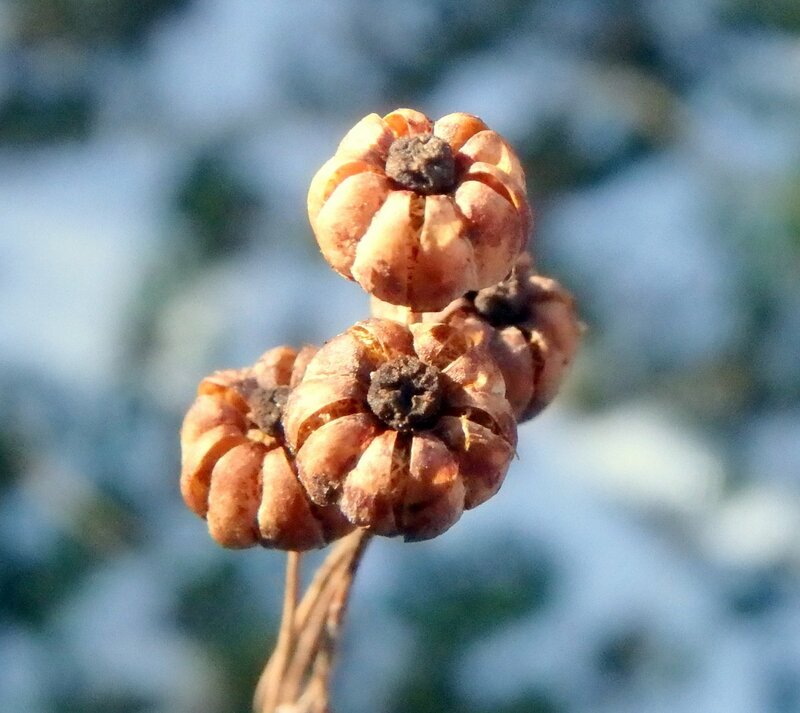 They are woody and split open into 5 parts to release the tiny seeds. Each capsule is about a quarter inch across. They remind me of the seedpods of the Indian pipe (Monotropa uniflora,) in some ways. When I finally got my driver’s license at 16 I would give my grandmother rides to the cemetery to visit the family graves. 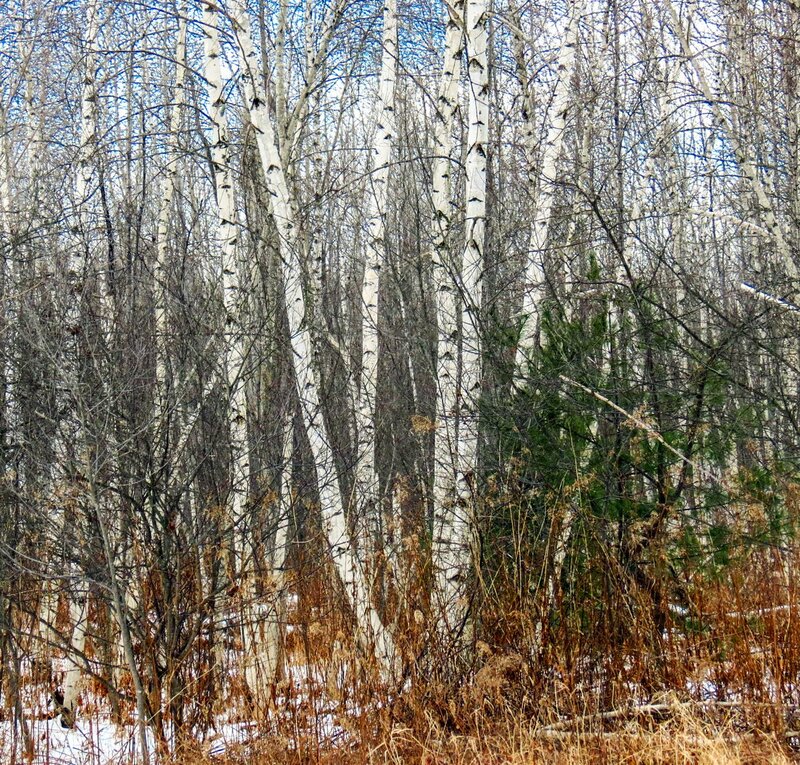 Near there was a wooded area and we would walk through the woods looking for checkerberries, which we had done since I was just a small boy. I can remember her always hoping we’d find some mayflowers so she could show me what they looked like, but we never did see any. That’s because their very fragrant flowers were collected for nosegays to such an extent the plant became almost impossible to find. 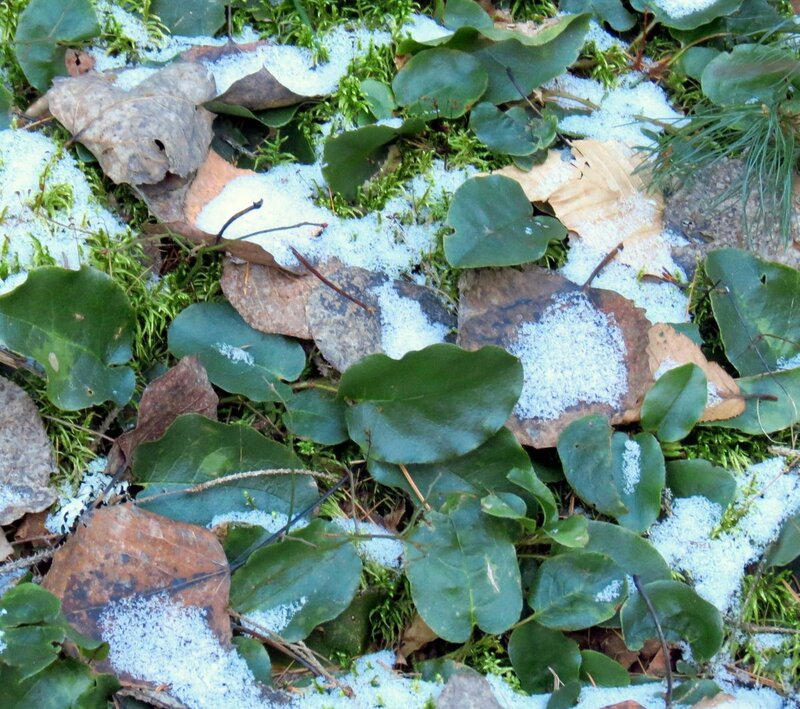 Another name for mayflowers is trailing arbutus (Epigaea repens,) and my grandmother would be happy to know that I’ve found several large colonies. Many plants come with memories attached and for me this one comes with some strong ones. 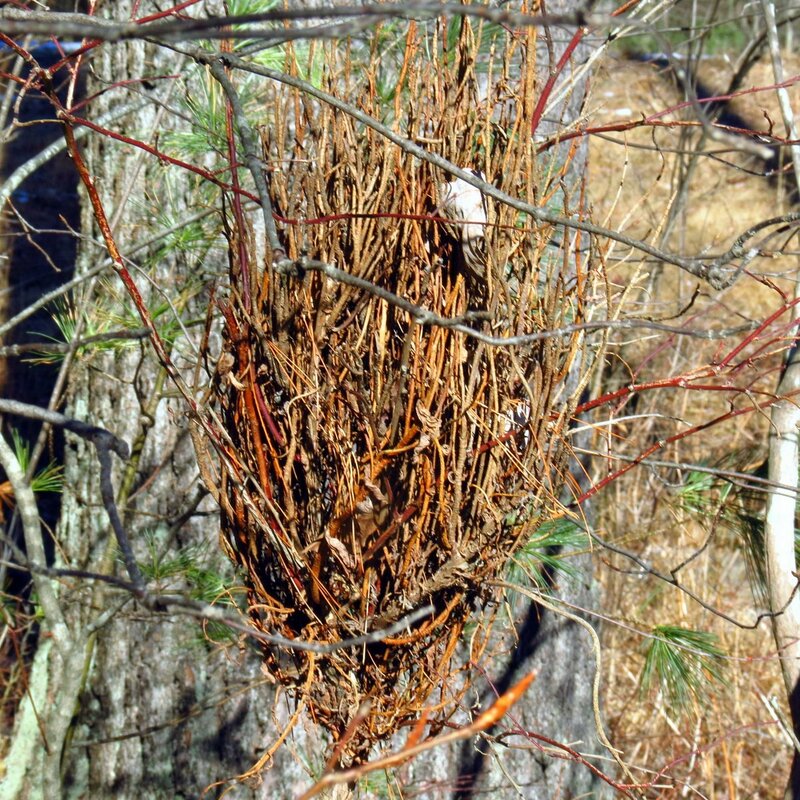 I saw a very large witches’ broom on a blueberry bush. 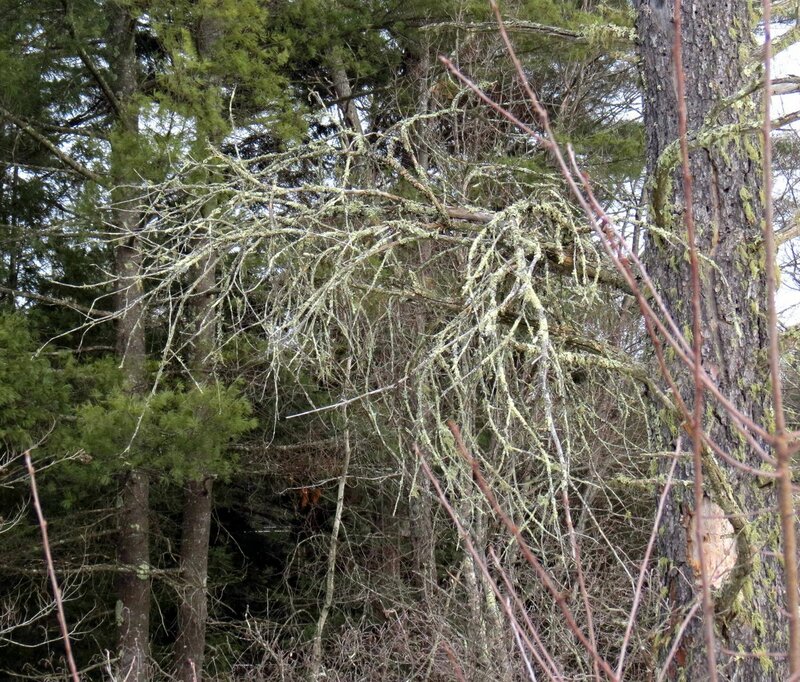 This deformation is caused by a fungus and causes a very dense cluster of branches to form. Though they might look unsightly they don’t seem to harm the plant. 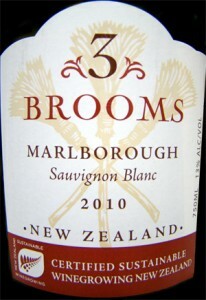 I picked berries for many years from a bush that had a large witches’ broom on it. 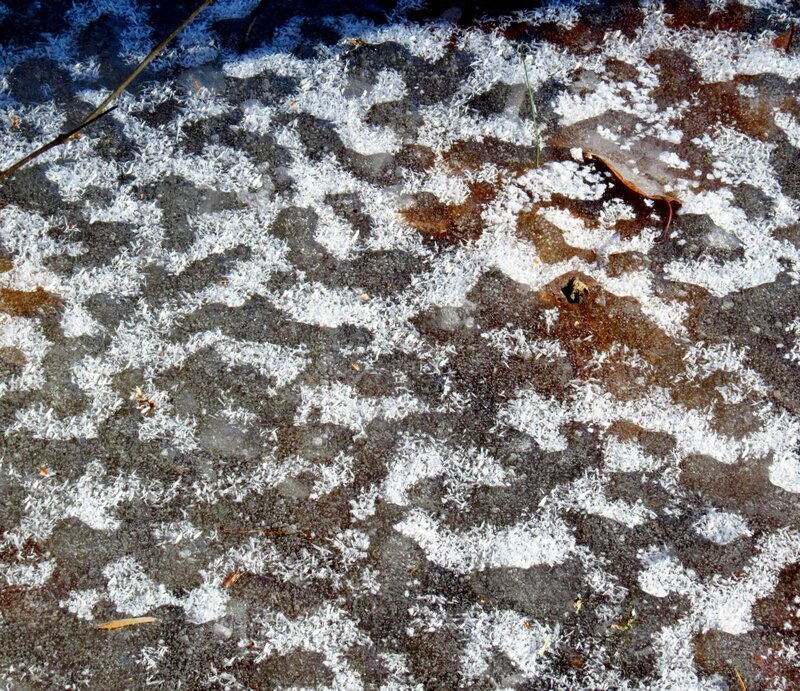 One part of the swamp had frozen into a pebbled, textured pattern. We had a small ice storm that coated the trees with ice. The sun came out but the temperature dropped so as the sun melted the ice on the trees it fell into water that was freezing below, and that’s what made these patterns in the ice. I know that because the same thing happened where I work and, since I spend a lot of time outside, I watched (and felt) it happen. 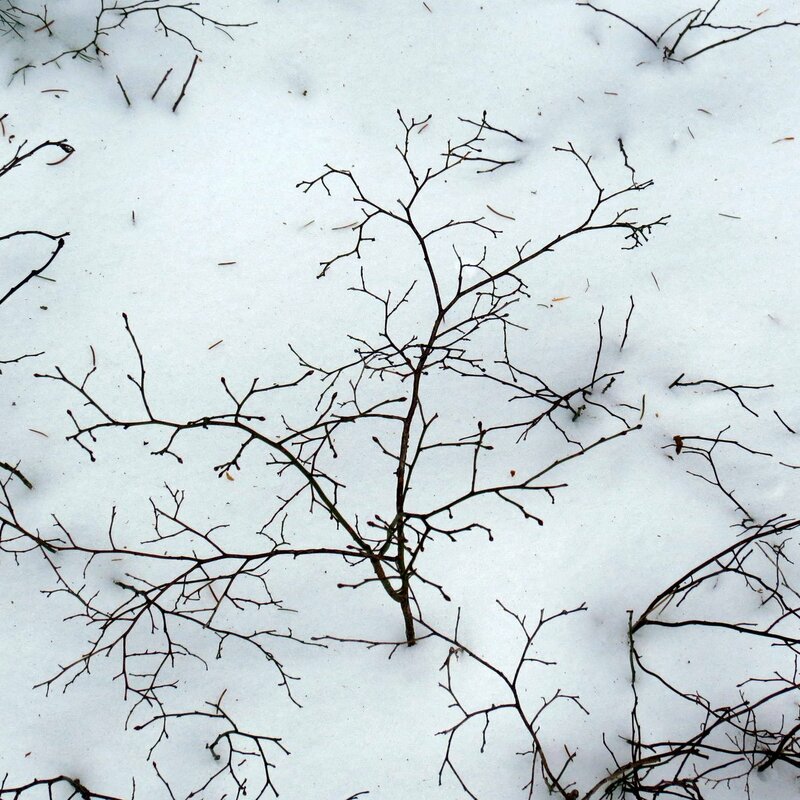 Millions of pieces of ice fell from the trees, rattling and tinkling as they fell. If they hit you in the face, they hurt. Clubmosses grew up out of the ice. These little evergreen plants are vascular so they aren’t mosses at all, but someone must have thought so at one time. 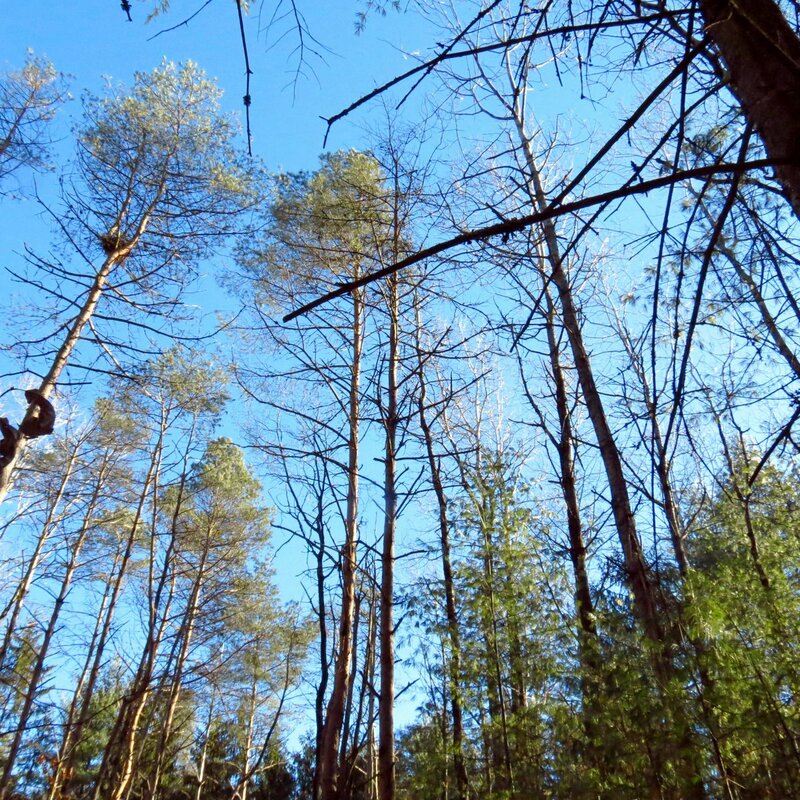 They are also called princess pine, ground pine and ground cedar but they have no relationship to those trees either. 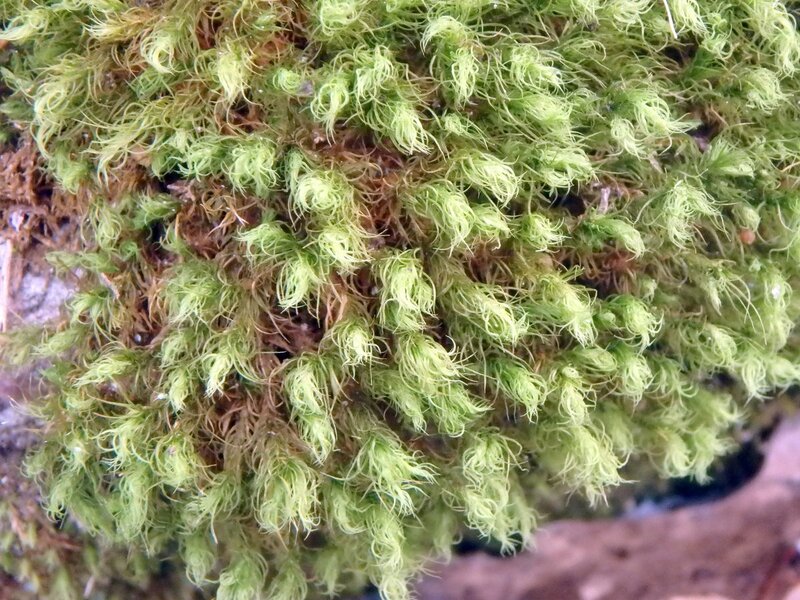 Clubmosses are considered fern allies, which are vascular plants that produce spores. Horsetails and Spikemosses are also in the same family. Clubmosses were used in a medicinal tea by Native Americans and the dried spores were once used to produce the flash in photography. 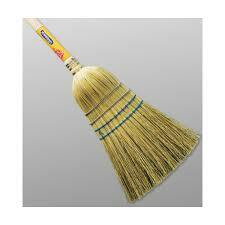 They are very flammable when dry. Goldthread (Coptis trifolia) gets its common name from its bright yellow, thread like roots. 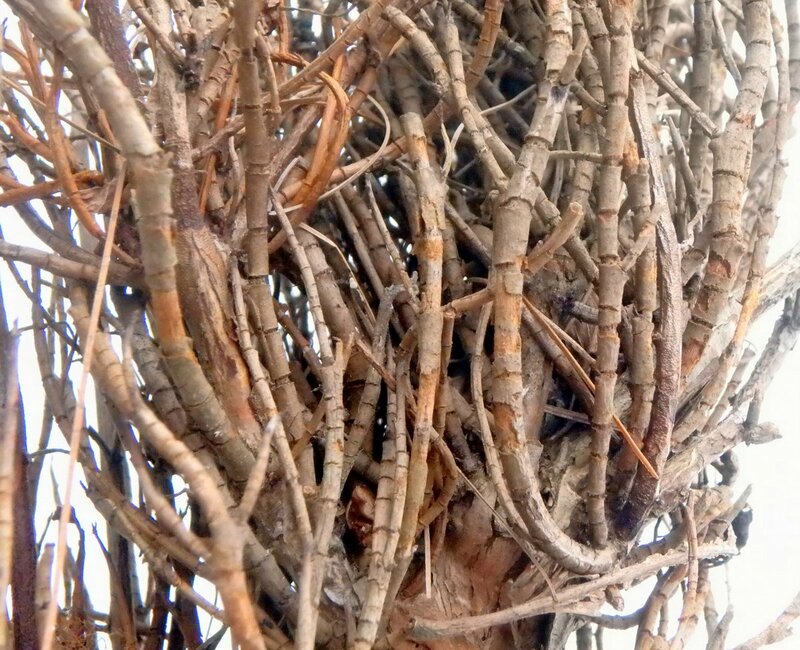 Native Americans showed early colonists how to chew the roots to relieve the pain of canker sores and that led to the plant being called canker root. 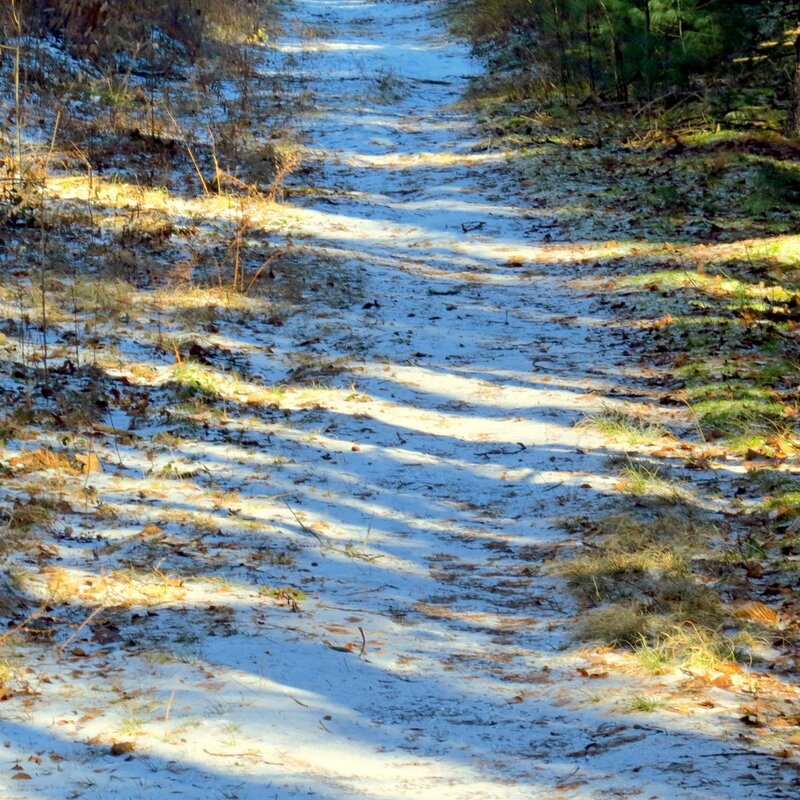 It became such a popular medicine that the Shakers were paying 37 cents per pound for dried roots in 1785 and people dug up all they could find. At one time more goldthread was sold in Boston than any other plant, and of course that meant the plant came close to being lost. Two centuries of being left alone have brought healing to Goldthread though, and today I see the tiny but beautiful white flowers quite regularly in April. 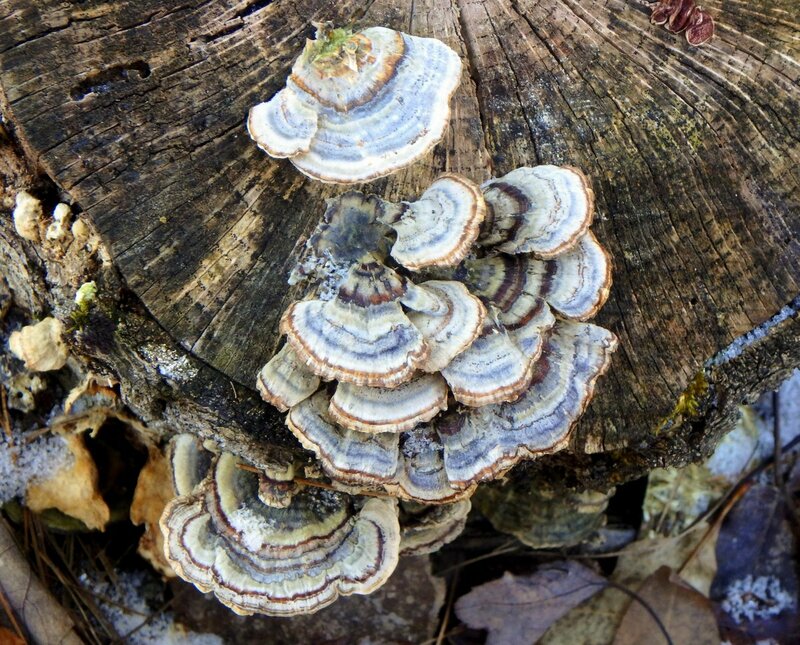 I finally saw some more blue / purple turkey tail fungi (Trametes versicolor.) They can be beautiful at times; like little painted fans. 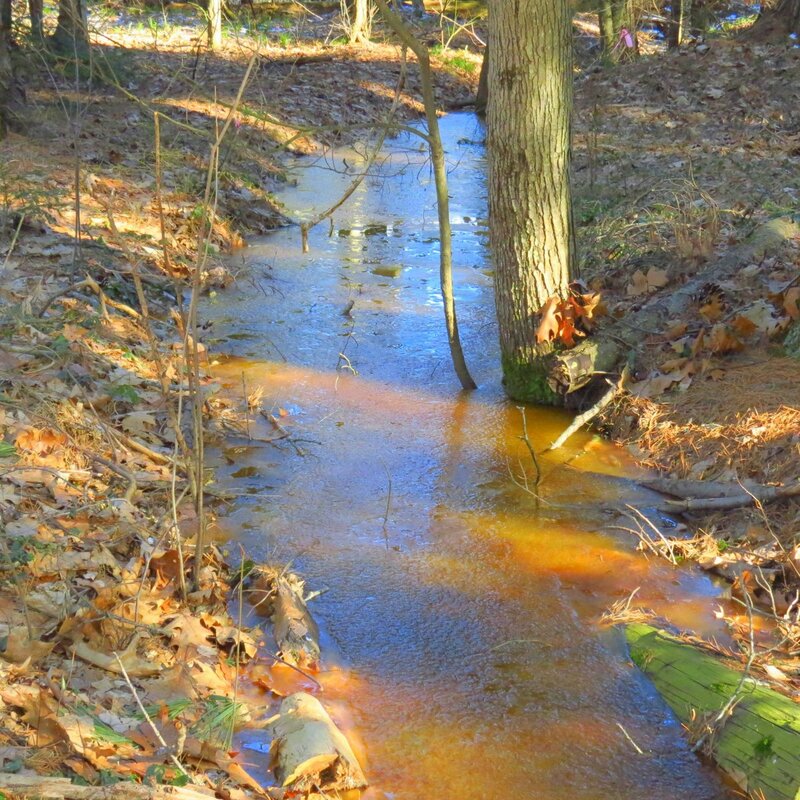 The small stream that brings water from the upper part of the swamp to the lower was strangely colored orangey brown on this day. I wondered if it was some type of algae that colored it this way; I’ve never seen this here before. 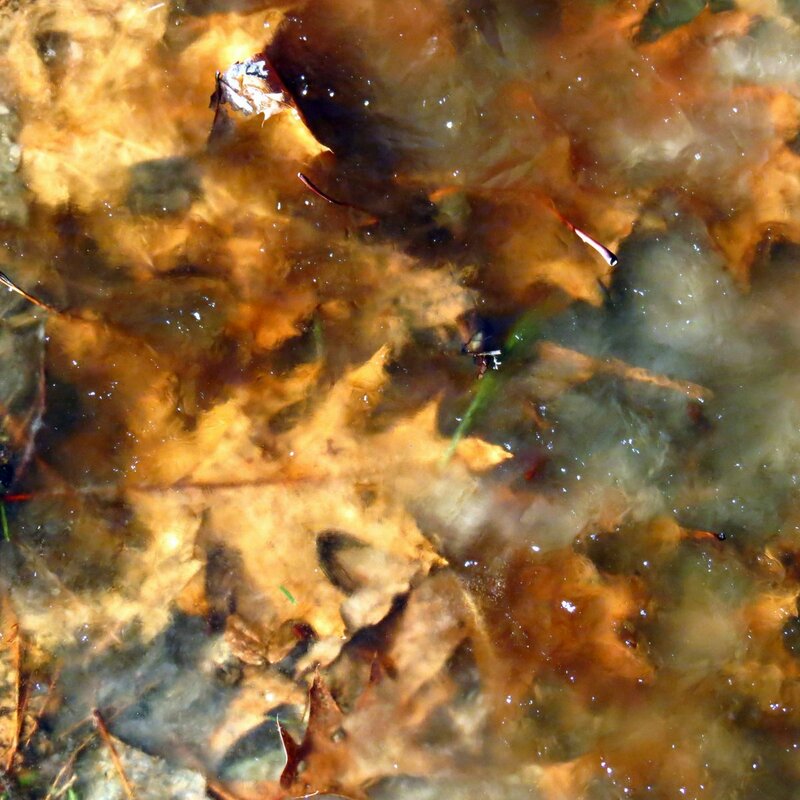 Maybe it was all of the leaves in the stream that gave it its odd color, I don’t know. A spruce tree had quite a large wound on it and a lot of resin around it. 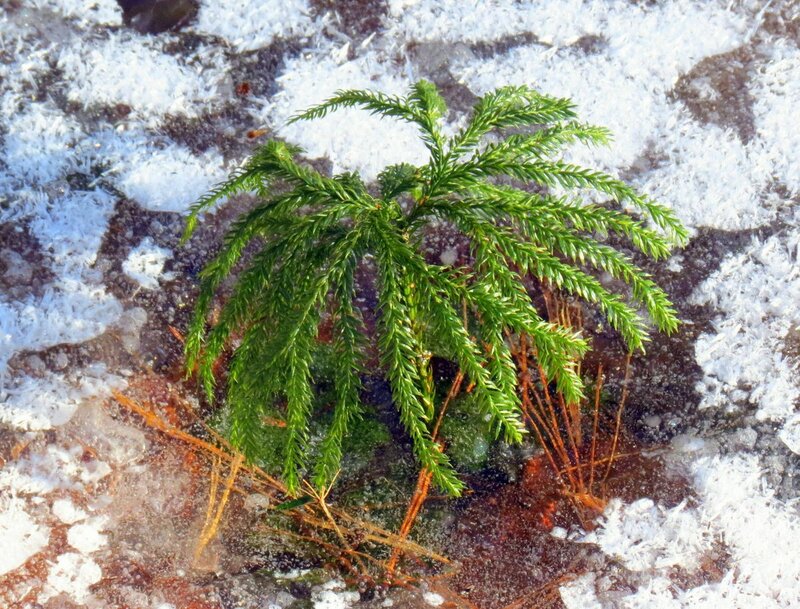 If you gently heat the resin, which is called spruce gum, of the black spruce tree (Picea mariana,) it will melt down into a liquid which can then be strained and poured into a shallow pan or other container to cool. After about half an hour it will be hardened and very brittle, and when broken into bite sized pieces it can be chewed like any other gum. 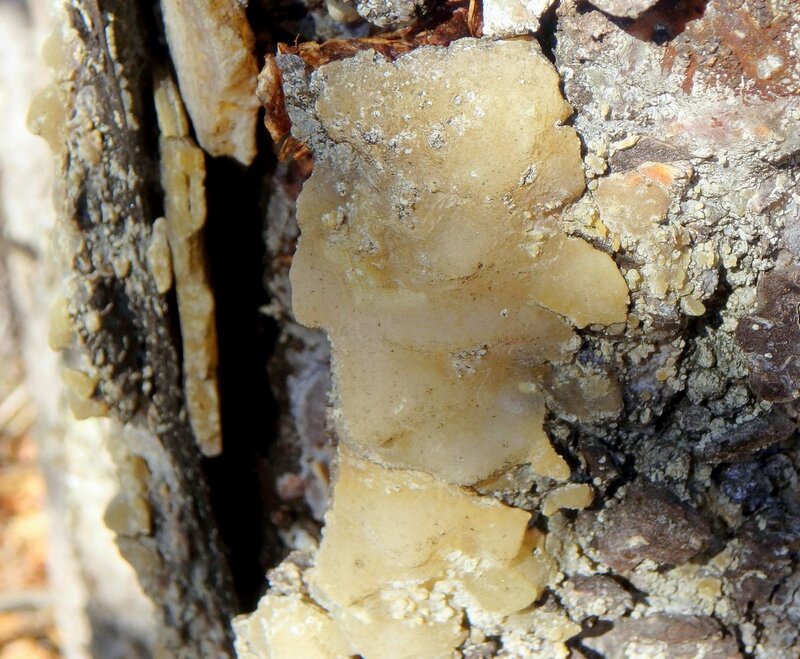 Spruce gum is antiseptic and good for the teeth. It has been chewed by Native Americans for centuries and was the first chewing gum sold in the United States.